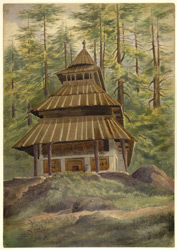 Water-colour drawing by Alfred Frederick Pollock Harcourt of the Hidimba Devi temple near Manali, Kulu, dated 1870. Inscribed on front in water-colour: 'A.H. Kooloo'; on back in pencil: 'Minali Temple Kulu. Doongree Temple Menalee. 1870.' This Hindu temple is situated in a sacred cedar forest 2 km from Manali. It is dedicated to the goddess Durga whose image is enshrined in the sanctuary built over a rocky cleft. The temple has a 24 metres high tower which consists of three tiers of square roofs covered with timber tiles while the conical roof is clad in metal. The wall are of unadorned mudcovered stonework while the wooden doorway is elaborately decorated with miniature depicting the goddess, animals and attendants.